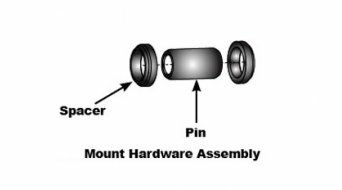 Here you will find matching damper bushings for your Ario until 2009, BAR, MC3, MC3R and Pearl. The bushings are offered as usual in sets for a damper eye, as some frame manufacturers use two different dimensions of the main frame and rear triangle. Indicated is the inner width of the receptacle or in other words the width of the damper including mounted bushings and the inner diameter of the bush = outer diameter of the damper pin. The slide bush, which is pressed into the damper eye, is already pre-assembled on new dampers and is not included with the bushing sets. When new, the sliding bushes can still have so much sliding coating that the bushings must also be pressed. This is not a reason for complaint. 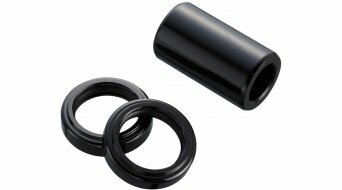 Rock Shox 12mm x 12mm damper bushes for one damper eye, 3 pcs. Please direct yourself in compatibility issues only after the manufacturer number, not after the possibly incomplete or too general article designations! Unfortunately we can not keep up with more than 4000 Rock Shox spare parts if a single spare part is suddenly compatible with another fork or that a spare part "for Reba" only fits the first series and not one of the two later ones. Contact us at info@hibike.de for your questions about Rock Shox parts - we also have a large collection of current and older parts catalogs, oil level documents and service manuals. To identify your fork or damper, it's best to send meaningful photos. Due to the time required we can offer this service only by email and not by phone.